Glass cooktops. You either love them or hate them. I kinda love ours. Except when I want to fry a batch of okra in my cast iron skillet and have to be extra careful about not sliding it. But that's another story for another post. This post is about cleaning the glass cooktop. Let me clarify here that I am NOT a clean freak. Not by any stretch of the imagination. I've never posted a tour of our kitchen because...well... we live in there and it gets messy. And usually stays messy. I cook a lot. Probably 5 nights per week. My kids also like to cook and they are messy. Especially when my 16-year-old makes mac and cheese. Even my husband cooks sometimes on the weekends. He loves to make scrambled eggs. And again, it gets messy. But when I have a few minutes with nothing to do (ha! ), I like to make my cooktop sparkle. Maybe it's because I'm a tiny bit OCD, but I love it when there's a reflection on the cooktop or the sink. Is it just me? 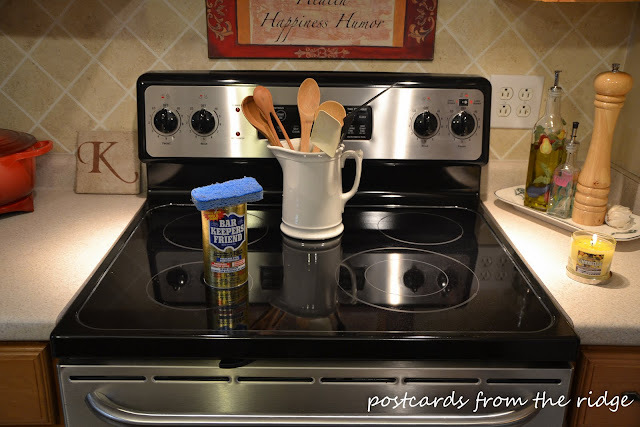 So here's my secret (although I'm sure many of you already know about this wonder product): Bar keepers friend. I've tried other products, but this just can't be beat. It lasts forever and only costs pennies per use. Take a good look because it won't stay this clean for too long. But again, it doesn't take long to get it clean again. 1. Clean off any buildup of gunk with a damp rag or sponge. If there's any stubborn spots I let the damp cloth rest on it for a few minutes and then it usually wipes off fairly easily. 2. Rinse out the cloth/sponge/rag until it's clean. Then dampen the entire surface of the cooktop. 3. While the surface is still damp, lightly sprinkle the bar keepers friend over the entire cooktop. 4. Use a damp sponge (I use one that has a scrubber on one side) and work in circles, concentrating on any areas that have cooked-on or burned-on food. You might have to use some elbow grease on the tougher areas, but with a little work it should come clean. 5. Rinse out your sponge and wipe the surface clean. 6. Buff or wipe the surface dry with a smooth cloth. 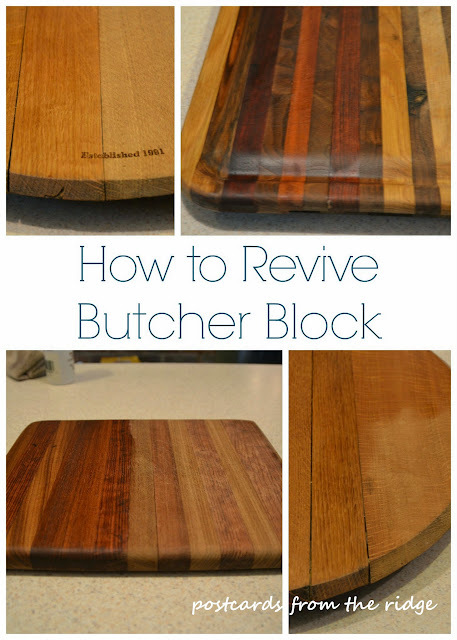 I have one particular dish towel that I use for this that doesn't leave any streaks. It's not a terry cloth type towel, but is a smoother, tighter weave. 7. That's it. You're done. Enjoy it while it lasts! Let me know if you use bar keepers friend for other jobs. 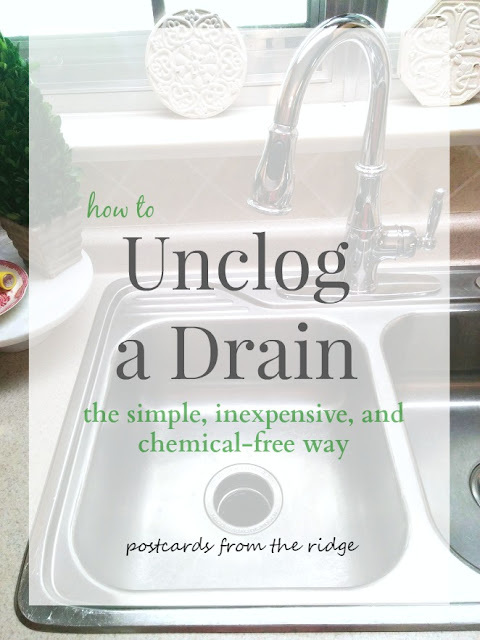 I use it in my sink and also to get stains out of our countertops. It's like magic in a can. If you like this tip be sure to subscribe to updates so you won't miss any of our upcoming tips and fresh ideas for your home. Click the box below to sign up. Angie!!!!!!!! I need the secret for the stainless appliance. We just bought a stainless steel fridge and if I don't get rid of the streaks I'm going to lose my mind. Your stove looks GREAT!! Thanks for the tip!! Can't wait to try it on my glass top. I've heard wonderful things about Bar Keeper's Friend and will have to pick it up tomorrow on my way home to clean. Awesome! I have used Bar Keepers friend for the sink, but never once considered it for my stove.... Now I know! Thanks for sharing! 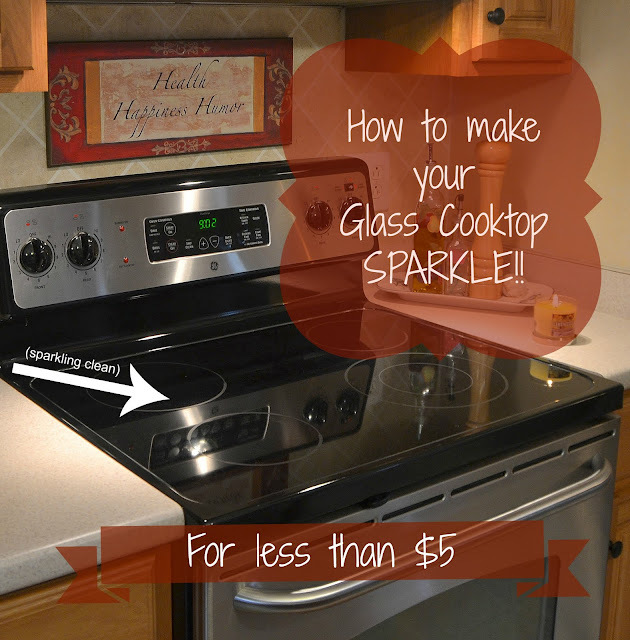 I love my glass stove top and I love Bar Keepers Friend!! My MIL turned me on to this secret product when I first got married & I love it....! Anxiously awaiting your post about the stainless steel secret! I have all stainless appliances, and they are DIRTY! I have such a hard time keeping them clean without water drops and fingerprints getting on them. Please help! 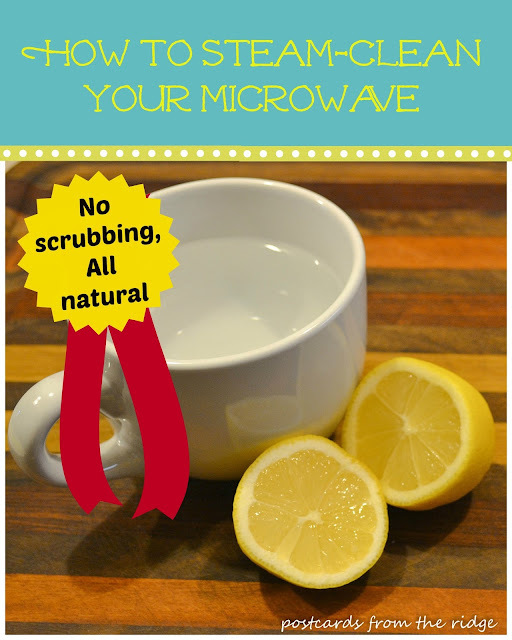 You can use it on your copper pots and pans to remove the tarnish and spots. I have a set of Emeril pots and pans that have a copper ring on the bottom. Makes them look like new! Also works wonders for getting the orange rust stains off of our grout and makes the shower pan white again. However if you want a less hands-on approach for the rust stains in the shower, THE WORKS toilet cleaner makes them disappear in a snap with no scrubbing. You do need to work in a well ventilated area for this, and it's very harsh. Don't get it on your skin. I came over from Google+ to see your secret. That's a good tip. I use steel wool -- even though I heard you're not supposed to. But -- I wet it, and rub gently in a circular motion until the spot is gone. Works for me, but I will remember your tip too! I also got a glimpse of your stove's position and that narrow counter next to it. Looks the same as my stove/counter situation -- and I am constantly cramming things in on that little counter-spot. You have inspired me to make it pretty! Now... where to hide the toaster. Wish we didn't use that thing so often! I use to clean my pans - inside and outside. the "burned" marks that get on the bottom from heat - it will take those right off and keep pans looking like new! I tried the baking soda technique that Pinterest was all abuzz about a few weeks ago and it didn't touch the toughest of my problem areas...I'll be looking for some Bar Keepers Friend next time I'm at the store! I would hesitate about using abrasive cleaners on glass surfaces, because it will leave fine scratches that harbor germs. 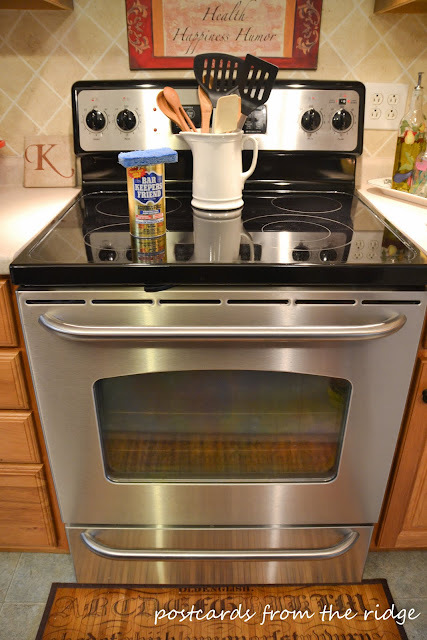 I loved my glass top stove in our last home and used the special glass top cleaner (kinda like Soft Scrub) with a NON-SCRATCH pad. I finished up with Sprayway glass cleaner for the shiniest stove top ever! Bar keepers also makes a liquid like soft scrub. I use it on my stainless cookware. Works great. We use the powder on the outside stainless grill. That works great to. Barkeepers friend is not an abrasive cleanser. It will not scratch like comet will. I have been using Bar Keeper's Friend, but it doesn't do anything for the 'permanently' burned on stuff that I have after 12 years! Ugh! I find that a single edge razor works to scrape the really cooked on grime off. Just have to be careful. also, I am going to try warm cider vinegar soak on a paper towel. My stove is fairly clean because I have no kids, but my daughter's is seemingly always needing deep cleaned & I have used the BKF, but doesn't always cut the hard stuff. I love the hints and the responses. Learn so much. Have a great day. I love Bar Keeper's Friend, but I've also had success with Dawn, baking soda & vinegar. I usually drizzle Dawn over the damp surface, sprinkle with baking soda and spritz with vinegar. The Dawn eats the grease, and the baking soda/vinegar eat away at the crunchy stuff. Scrub, scrub, scrub. Once it's clean, I use a clean damp cloth to wipe away all the cleaning stuff, then buff with a dry cloth. 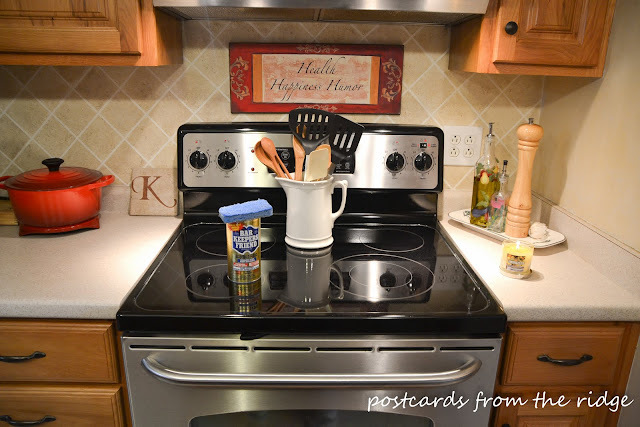 I use the barkeepers friend on my stainless steel pans, it is awesome! I use a razor blade scraper on my glass top stove, but sometimes, there are places that this doesn't get everything, I will be trying barkeepers friend on my stove top! I use barkeepers to take the scratches off my fiesta ware. Works wonders! Waiting for post in stainless steel refrigerator cleaner....takes me forever to clean mine, I hate it!! I had NO idea about the stove-top! I have used Bar Keepers Friend for years - in the bathtub! Takes that nasty ring off better than anything else I ever tried. Now, onto the kitchen!! Thanks! I just pulled some Bar Keepers Friend out and had to try it on my stove top. IT'S BEAUTIFUL! Thank you so much for this tip. I'll be trying it in the bathroom tomorrow. I can't wait. Great tip--love BarKeepers for my stainless cookware. I've also discovered that Arm & Hammer baking soda toothpaste works well on my glass cooktop. I rub it on the spots and let it sit for a few minutes before scrubbing it with a microfiber towel, and have been thrilled with the results. I tried baking soda first, and it didn't remove everything. Bar Keeper's Friend got everything off the surface. Sorry but I just cannot agree because I have used and Do not like Bar keepers! But I do like using Bon ami and CameO on my pots & pans & stove. Thank you for this! I found it a week or two ago and tried it. After 18 months of living with a disgusting glass cooktop, I can now clean it! Many, many, thanks. the only "powder" I use in my kitchen for years. Sink stains, stainless cookware, getting wine stains off laminate countertops, and heavy (pam) grease stains off cookie sheets. It's on my amazon subscribe and save. Don't use cast iron on a glass cooktop!!!!! They can crack the top of the range and make it explode!